Apologies for uploading a day late! I'm trying to move house, so it got lost amongst viewings and phone calls. 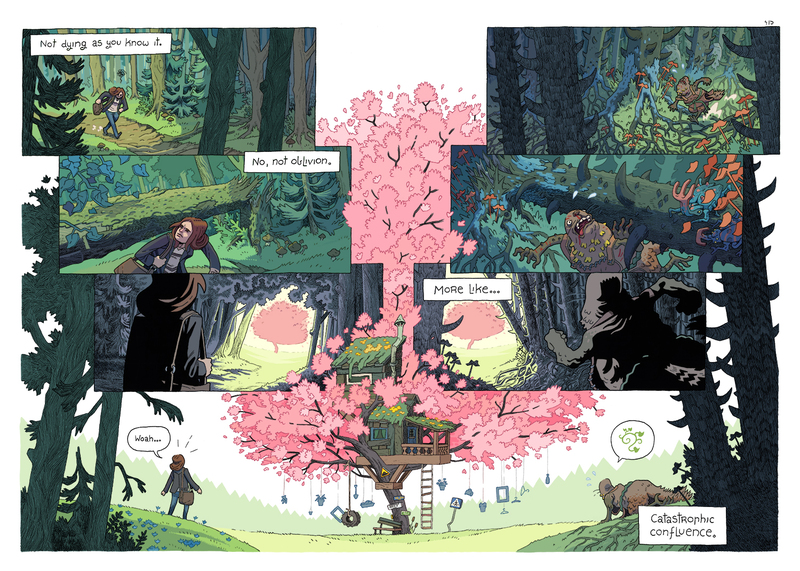 Anyway, here's page 4+5, which we think is a great double spread. “That’s right, little brother. The flowers started coming, and they came from the oldest brother. Whenever he said his special words, flowers and trees and crawling things came. It was beautiful, but then grandpa told them another story. He told them that one day the sky would turn red and the mountains and clouds and singing winds would stop being there. He told them that all of life was about finding balance and that when the balance of the whole world was too far out, the spirit that sleeps inside of it wakes up and restarts everything. He told them that when the spirit restarts the world, there's always three left. He said there would be one to create the world, one to protect it, and one to destroy it. It would be their fates and their efforts that keep the next world in balance. And then it happened. The singing winds stopped singing, the sky turned red and the clouds and mountains went away. The stone boy was very scared, but his brothers were there, and they looked after him, even though they were scared too. And then, just as everything was about to fall apart, there was a great white flash of light, and it was quiet. And then it was dark again. It was night time.